We are in the process of moving a number of our offerings to new servers. It’s rather exciting, but also a little insane. I am certain that in the end we will provide you greater speed as you utilize our sites and it will provide us greater abilities to enhance/expand services. The process of doing this apparently isn’t quite as simple as flipping a light switch. All schedules and programs will be back up soon for your easy reference and utilization… Sorry for the inconvenience. Insomnia – It does your Business Good? Generally speaking, I love my sleep time. I definitely think and feel better throughout the day if I get enough of it and even better if a cat nap presents itself as well. There are even plenty of research studies that scientifically prove that our mind benefits and much of what is accepted in the fitness industry is based on scientific research… So, what the hell am I doing out of bed so early today??? It’s 5:05am and I’m sitting in a dark home office typing away. It was just a little over an hour ago when I first rolled over in bed and the eyes would no longer stay closed. So now to decide if there is a reason behind this blog post or is it just an opportunity to whine? I don’t have much whining to do even though I’m not all cozy in bed. With the house quiet and only the cat bitching for a little food I am getting a lot done and there is a lot to do (probably part of the reason there was no going back to sleep). What I am realizing is that I’m getting quite a bit done and even have time for this blog post. With this new efficiency I am reminded of a program I went through by a guy named Eban Pagan. Eban spent some time doing a video series on time management and one of the primary keys to getting more done is the elimination of multitasking. I found this hard to believe at the time and even if it were to be true, the day to day activities of a father, husband, business owner, coach, board member, etc. made it impossible to accomplish. I did and do take him at his word and the research that went into making those claims on efficiency. I have and do attempt to block tasks together. I don’t jump at email every-time the little envelop pops up. I let many calls go to voice mail and in the end I am able to stay on task a little more often. But, if you want to take it to another level, try this insomnia thing out. Having no one else in or around the office, phones off, only you folks on the East Coast to worry about sending emails at this time, or God forbid calling… Well it’s a great benefit to your productivity and it’s getting me one step closer to having the new and improved fitness pro travel site ready for release. Not only does life seem a little crazy because it’s the holiday season, but with Fit Bodies adding new resorts and positions and the continued building of new features to Fitness Pro Travel, well… lets just say many of my days have run into the evening and night. Don’t get me wrong. I know that with this or any other businesses, busy is good. My intent is to stay busy as well, even during a recession. I think part of the reason for the continued requests for our “business” services is because I/we continue to market our offerings and concentrate on the customer. It’s proving beneficial in attaining more resort positions for Fit Bodies as well as more consulting, training and consulting clients for FIT Launch. I intend to run with that 100% track record and with our local training business I have only seen it proving true thus far. Market aggressively, network continuously, and treat your customers like royalty. PS – The new FPT features include a number of programs that can be utilized to assist your business development. I’m looking forward to showing you how they work over the next several weeks and you can expect completion of those features and their operation made available within the site very early in January. (just in time for new years resolutions)… You want an early look? Be sure to sign into the mailing list at Fit Pro Biz. A couple great videos found. Actually found both because of social media connections. One was sent to me from a twitter connection and the other through an RSS feed.The first speaks to the building of your personal brand via social media from Gary Vanerchuk (adult language) and the second is an entertaining twist from the folks at HubSpot on InBound marketing. Both made me laugh, but it could be the geek in me that enjoys internet marketing and the viral power of a passionate presentation and simple re-mix. To start this blog post off, I want to refer you to an article. It was written by Tim Kerber covering the social media phenomenon Twitter. He’s way smoother than I in getting a point across so if you want to learn about tweeting on twitter and how it can benefit you personally as well as your business. Check it out. A little bonus that was found with a google search (also picked this one up from Tim) is the discount code CHH3. It’s time to renew a couple internet domain names and pick up a few others. I primarily work with GoDaddy for domain registration and that discount code saved me $18+ on the order. Not bad. If you use GoDaddy, give it a shot. Outbound Marketing is the “push” style marketing used for many years to reach potential clients. Inbound Marketing, on the other hand, is the art of utilizing social media opportunities to encourage potential clients to come find you. It is the opposing “pull” style of marketing. Monitor, interact, and influence your athletic or fitness prospects in social media settings and draw them back to your arena (website) with a trusted, transparent, “friendship” bond. Consumers are extremely savvy these days and with the many tools the internet provides, they have many locations to gather information on you and/or your company. Pushing your sales message is easily discarded and ignored. Allowing them to know you and your business through social media will build trust through transparency and encourage them to call on you when they or their connections need your product or service. HubSpot is a company that has several tools and informational pieces to help you to enhance your inbound marketing efforts. You can check out one of their promotional videos below – enjoy. Since most readers of this blog are involved to some extent with the Fitness Pro Travel programs, I feel it’s a little necessary to warn you on potential hazards of travel to tropical locations with loved ones. because of your fitness specialty. It’s a warning that you may lose cherished memories and be out an expensive piece of equipment. Getting the warning and the gripe off my chest. Recently took new Canon FS10 video camera with me to the Fit Beach Conference in Negril Jamaica. Went down working well, most of the week it worked well, but on the last day of trip the screen displayed only white and no other functions would work. One fortunate item was that I had saved all items to a SD Card rather than the units hard drive. On return I talked to Canon repair rep. All sounded good. Package and send to repair center… only the cost of shipping. No problem. Got the unit back today with same issue occurring. Note said unit had water damage. Called the repair center and after a long discussion I was told to buy a throw away camera or a higher end water proof version (told prices as high as $8000) for vacationing in humid locations. Does canon make some great “throw away” camera? Their final say was that high humidity was water in the air… duh. And, that if any water collects on the inside of any electronic equipment it will ruin it… got it. The surprising part was that they refused to stand behind product to fix or replace because the atmospheric air (without rain) caused “water damage” that is specifically excluded in the warranty terms. My conclusion is to not buy another Canon, prevent my friends from making similar mistake, and to cause a small social media ripple of pain to the big company that just cost me more than $400. I feel much better now… thanks for listening and please pass the message along. New benefit suggestion for blogging in your business or personal life… therapy. I encourage you to attempt to join this webinar, which is brought to you by HubSpot… They finally realized we are officially in a recession. This does greatly effect large and small businesses within the fitness industry. HubSpot is a group I listen to a great deal when it comes to learning innovative techniques and trends for 21st century marketing tactics. Let me know if you make it and your thoughts. In a recession, marketing budgets are often the first to get slashed. For many that means cutting programs, cutting spending, cutting staff in order to make it through the economic downturn. But marketing in a recession isn’t about marketing LESS, it’s about marketing BETTER, SMARTER. This webinar will share techniques for marketing more efficiently and effectively, particularly on a tight budget. You’re up against a crazy “fix it fast mindset” if you are a health & fitness professional. Spending quite a bit of time on the business side of fitness (nationally/internationally) and having the ability to watch as my wife implements various programs or marketing tactics within our local operations, gives me an interesting perspective. I see much of what is being offered as business education & programs to the fitness professional and I have the opportunity to create and test our own. It’s pretty simple to see that within the fitness industry a lot of attention has been paid to the personal trainers while the group fitness instructors seem to be going the opposite direction. Programs like Mega Marketing, BootCamp Blue Print, or Fitness Business Revolution each are targeted to the Personal Trainer and the list goes on. These programs can all be made applicable to the group fitness and yoga professionals if you are willing to look at your fitness specialty as more than just a part-time job working for a club. Personal trainers are figuring it out and it might just be time you do as well. Tell me, which certification is geared toward group training? I’ll give you the answer; The one that has the word “group” in the title. That being the case, why is it that small group training and “bootcamps” are dominated by the personal trainers? Trainers are using these formats to generate incomes of well over $100 per hour. They are taking advantage of internet marketing and building lists of participants that they can continue to market to into the future. They are also diversifying their business and offering related fitness products, supplements, information, etc. I do not see the Group Fitness and Yoga Instruction professionals doing the same thing at all. They seem to be content to work only for the facility and are missing out on many opportunities that are available to them. You are trained to create group programs, monitor participants of various levels, and to safely provide modifications for all to actively participate. Because of the focus of these training on groups, YOU are the best qualified to be leading the “bootcamp” (actually, just session classes) styled programs. 85% of the population does not belong to a fitness facility. 60+% of the population is overweight or obese. The diet industry is huge. The fitness equipment industry is huge. The anti-aging movement is huge and growing. – bottom line is that people are spending lots of money on things you can actually provide. Group trainings lowers the per person cost to participants. You will make more dollars per session/class while charging individuals less. You are leaving money on the table, allowing your brothers & sisters from the personal training side of fitness to eat into what should be primarily your client base. These programs are not rocket science and will help you reach more people and make a greater amount of income. We are working on a program specifically for group instructors to help you get started as well as others to catch you up to speed on bringing your expertise outside of the group fitness studio. Your thoughts and feedback are greatly encouraged as these programs are finalized. You know the questions and concerns you have with branching out and I’d like best to ensure they are addressed. Post your thoughts here or send them to me at fitpro@fitprobiz.com. While I encourage personal trainers to get training to work with larger groups and add these types of programs to their offerings list, you the group fitness instructor have a few advantages right off the bat and I’d love to see you take advantage of them. 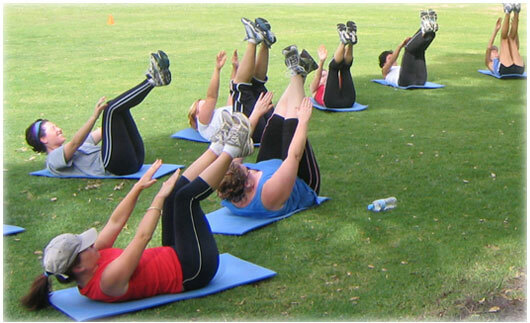 You are trained specifically to work with groups of various fitness levels. Group fitness instructors generally have the ability to offer multiple formats of classes. BootCamp is only one style that can be performed in a gym, field, or apparently a combat zone. Just because this is the primary format that personal trainers have attached themselves to doesn’t mean you can’t take your other formats outside the standard gym setting or offering structure. I believe it is generally easier for a person who has picked up the principles and abilities important to group fitness to get further training and diversify themselves as personal trainers rather than the other way around. What you do is not the same, but it is similar. A small amount of related training will make you very proficient and capable to run these programs. I hope you consider what you may have been passing up. You have skills that can be provided in many different locations, can reach many fitness needy lives, and these skills can be utilized to generate a great deal of income for you and your family with minimal extra work. If you want to learn more about how to start these programs as a group instructor, let me know your interest. Mentioned a few days back that there are several social media sites I’m involved with, if for no other reason than to check out features that may be beneficial to our Fitness Pro Travel community. So, part of that fine research includes participating in a community that is being lead by Dax Moy. He’s a fitness professional out of Australia, whom I can tell has had some marketing experience and is trying to take advantage of social media benefits. The VERY nice thing about Dax is that he seems to still care deeply about the client and not just the dollar. I’ve been through several marketing programs, online and offline, and I can’t help to feel a little dirty from time to time as money tends to be the only motivator for many marketers (not all). That’s not always best for the client/customer and I don’t think it’s good for the fitness professional as well. Here is a video that Dax posted on his blog that is inspirational and speaks to our motivation and our principles. It was made in conjunction with a products he is involved with, of which I know nothing about. You can check it out if you like, but the video is just under 4 minutes and stands fine by itself. My excitement has been building lately for the new Fitness Pro Travel features being developed. Since we asked for your feedback on site changes that would enhance your fitness travel and business several months back, it has been a pretty steady road of research, building new fitness connections, building new business connections, request for proposals, networking, testing, reworking, and so on. While that has made things hectic it has been and continues to be a great learning experience. We have been able to address the majority of your thoughts and have developed future plans off of those to continue the community enhancement project. CEP? Think we should call the project by the abbreviation? 🙂 It’s going to rock. My most recent excitement has come from several industry leaders who have added their insight to the project as of late. Those contacts have been very valuable and it looks like we’ve found a way to share much of their insight with the group. Several have offered to throw in bonuses to coincide with the launch of our new features. That means that we all will receive some great content from fitness and business experts that will benefit each of us in addition to the new features and that’s without any cost. I know I’ve benefited by working with them and am certain you will as well with their offerings. It looks like we are literally down to our last month before we present the results of these (phase 1) changes. Several items are completely done and we are testing them now. Others are nearing their completion. Be watching your emails in the next couple weeks for information on sneak peaks that will give you a look inside and an idea of how these new features may be utilized. This project has not only been exciting, it’s also been nerve wracking. While I know the principles and features can directly benefit your personal, travel, and fitness business, it’s tough not second guessing and doubting the investment from time to time. I’ll leave you today with a quote from French writer Anatole France that has come to mind more than once during the process.